In 2013 the Obama regime and George Soros' Open Society instigated in a string of coups and uprisings known as the Arab Spring. In 2014 this was followed by the successful Euro Maidan revolt against the democratically elected, pro Russian Government of Ukraine. Investigative journalist Lee Stranahan is exposing this cabal after Ukraine was implicated in the plot against President Trump. UPDATE: The analyses of the intrigues around the Justice Department, the FBI, and Special Counsel Mueller, the FISA orders based on the fake dirty Steele dossier and the White House have gone into the weeds. Very few have posed the question, why the deep state was so married to Crooked Hillary and got so entrenched against Donald Trump. They did not think he was a suitable president, is one often cited explanation. Sharyl Attkisson is closer to the mark, theorizing that the deep state in the Intelligence Community didn't trust Trump with their methods and means of intelligence gathering and surveillance. But that's just one aspect of it. The IC's history is rooted in the Cold War against the Soviet Union. Even now, many are having problems separating the communist state from present day Russia. While Putin's country is no example of a Jeffersonian democracy, it's a far cry from the USSR. Nevertheless, to many in the IC Russia and the USSR are one and the same. When candidate Trump took a carefully calibrated stand for detente with Russia, the old hands in the IC immediately sprang into defense mode. They never stopped to think. They misunderstood, but the die was cast. Trump was never about isolationism. He was always led by serving the interests of the American people first and peace through strength or Pax Americana. It's ironical that the IC largely consists of globalist neocons, who are putting the interests of "the world" before those of America. But that is not the point here. Stranahan is right: the deep state thought he was isolationist. That scared the hell out of them. And that is, what this is all about! The deep state is not synonymous with the Democrats. But evidently they share an agenda. Never Trumpers may also overlap, if they are not one and the same. Evan McMullin is cleary a deep state agent. In the mental war against arch enemy Russia, collusion with Ukraine is a virtue! Julian Assange and Wikileaks, reminding us of the Steele-Isikoff-Ukraine annex are bringing us back to the connection of Ukraine with the Chalupa sisters in the DNC (scroll down), closing the circle -- not of Russian interference in the election -- but of collusion of the deep state in the Intelligence Community with Ukraine. So, Hillary colluded with Ukraine AND Russia!? When does the HPSCI start HER investigation? The fact they identified as Ukrainians is not without significance. Schiff was obviously prepared to take their word for it. Why? He wanted to smear Trump. But he was also predisposed to trust the source. Don't miss the intro, but if pressed for time, Stranahan's main beef starts at 18:30. We are adding a few notes and comments from the Objectivist point of view on the morality of the overthrow of Governments. Stranahan is making the argument that eighty percent of people in general are morally repulsed by such interventions, specifically if carried out by followers of ethnic nationalism (racist collectivism). Objectivism makes another case. If life, liberty and the pursuit of happiness is the standard of good and evil, dictatorships and democracies are not moral equals. In fact, dictatorships have no moral right to exist. They may be overthrown, but on the condition that the coup leads to more life and liberty. Now that we know that the coup against Ukraine was instigated by a globalist cabal, the question we must answer is, is globalism morally better than Putin's autocracy? This question is less easily answered than you might think since there are degrees of freedom and oppression. Globalism is top down rule by an elite and goes against the democratic principle of self rule by the individual voter (Globalism versus Nationalism). The dictatorial nature of globalism has no yet been fully established, but this is where we are going. Hence, the moral case of the overthrow of the democratically elected, pro Russian Government of Ukraine by an equally autocratic, globalist cabal must be rejected. Especially now that we know the history as ferreted out by the excellent work of Stranahan. Watch this video of representatives of the European Union, Guy Verhofstadt and Hans van Baalen going all sentimental over stretching their dominion all the way up to the Russian border. Feb. 21, 2014 Guy Verhofstadt and Hans van Baalen demagoging on Maidan Square in Kiev. Watch the films Ukraine On Fire and Occupy Unmasked for the parallels between the Maidan revolt and the current agitation and provocation strategy and tactics of the #Resist anti Trump coalition. 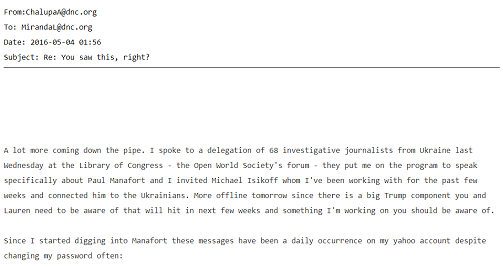 Veteran DNC operative, Alexandra Chalupa worked with Ukrainian government officials and journalists using public resources to dig up Russia related opposition research on Trump and his campaign manager Paul Manafort. A secret ledger led to Manafort's resignation, but Ukraine later rescinded the report as false. Ukraine apologized profusely to President Trump in order to restore relations; the media simply buried the new information. A US Navy veteran on Twitter clearly has deeper insight into the matter of the connection between Soros' instigated Maidan revolution in Ukraine and the current cultural insurrection against President Trump. We will relay a threat a recently posted on Twitter. The protests were failing to achieve the objective of forcing the resignation of President Yanukovych. Aug 15, 2017 Infowars' Lee Ann McAdoo talks to Lee Stranahan about the Ukraine and Soros connection to the "Trump Resistance". As evidenced this weekend, a civil war is brewing in this country, laying the foundation for a violent coup to take out Trump. Soros-funded NGO's have been able to achieve regime change in other countries like Ukraine by quite literally teaming up with Neo-nazis and "moderate" terrorists. Now, investigative reporter Lee Stranahan reveals the same players involved in the Ukraine overthrow are working behind the scenes to oust President Trump. Turns out the leader of "Unite the Right" has emerged as a Democrat, an Obama voter and a CNN assignment editor working with Occupy. He's suddenly out of nowhere emerged as a extreme right figurehead. Files: Charlottesville - DNC hack - DNC/Ukraine collusion - CIA Coup - SoroS - Russo-Ukrainian war - Fire McMaster - Oliver Stone Putin Interviews. DNC COLLUSION WITH UKRAINE: STOP TRUMP! Investigative journalist Lee Stranahan storified and periscoped new information on the DNC's collusion with the Ukraine Government and shows how the media covered it up. Obama State Dept. official and head of the Ukrainian desk Evelyn Farkas made sure that as much information as possible was distributed to ensure leaks by Obama leftovers. Stranahan has notified a congressman and is about to inform the White House about new developments in the story. Stranahan was tipped off that an Ukrainian person was sent to Washington at public expense just after Trump's election, to talk to Democrats on Capitol Hill in order to prevent Donald Trump from taking office (Periscope broadcast at 15:22). Chalupa met with Ukrainian Ambassador Valeriy Chaly and one of his aides, Oksara Shulyar, at the Ukrainian Embassy in March 2016 to talk about unearthing Paul Manafort’s Russian connections, Chalupa admitted to Politico. Four days later, Trump officially hired Manafort. “The day after Manafort’s hiring was revealed, she briefed the DNC’s communications staff on Manafort, Trump and their ties to Russia, according to an operative familiar with the situation,” Politico reported. After Trump’s shocking electoral victory, the Ukrainian government told Politico, “We have never worked to research and disseminate damaging information about Donald Trump and Paul Manafort.” But Andrii Telizhenko, a former Ukrainian embassy officer, told Politico that he was assigned to work with Chalupa.